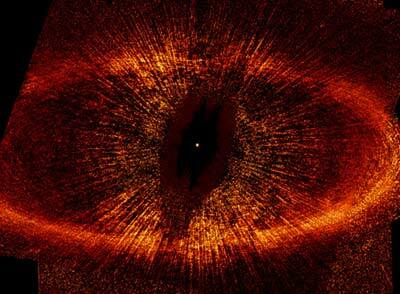 “Sauron's Eye”: a dust ring around the star Fomalhaut, 25 light years away in the constellation Piscis Austrinus. Read the article in New Scientist. The photograph is from the Hubble Space Telescope and the European Space Agency. My favorite reference resource on the web for Tolkien is the Encyclopedia of Arda. There are, of course, innumerable others, many of which are excellent. Encyclopedia of Arda has an exhaustive list of links to them. I have posted to these Tolkien forums under the moniker Alcuin. * If you made it here or know me from the forums, and the Spirit moves you, e-mail me. Here are some essays I have written on Tolkien. A Peek at the Last Entry of Sauron's Journal in Númenor - it must be from the last day that Númenor still stood above the waters. Not exactly an essay, but an extensive piece of work based upon a thread at Entmoot about what happened in Bree the night Frodo had his "accident" with the Ring. The family and heirs of J.R.R. Tolkien retain his copyright and legal rights through the Tolkien Estate, and Tolkien Enterprises owns certain other rights. This website is not affiliated with those organizations. It is a scholarly pursuit of the existing corpus of J.R.R. Tolkien. We acknowledge their rights. All reference to published material is what we honestly believe to be fair use for scholarly pursuit. Here is a page of the principal owners of rights to the works of J.R.R. Tolkien, as far as I am aware. * Other folks use the moniker “Alcuin”, too. I have listed the boards on which I actively participate here.